ANAHEIM, CA--(Marketwired - Jun 27, 2013) - Mark Wels, President of MK Battery, and Ta'avasa Mamea, President of the United States Power Soccer Association (USPSA), jointly announced a multiyear agreement granting MK Battery the exclusive Title Sponsorship rights and Official Battery designation for all of the U.S. Power Soccer Conference Cup tournaments and Team USA (current World Cup Champions) international competitions, including World Cup 2015. "Power Soccer is the fastest growing team sport for power wheelchair users in the world," said Mamea. "MK Battery's financial support and worldwide reputation will significantly help accelerate the sport's growth. On behalf of the athletes, families, fans and volunteers, we are grateful that an international company like MK Battery has become a huge advocate and active partner in the world of power soccer. I cannot tell you how happy I am for the families and athletes for how this will affect their teams!" The USPSA is the governing body for Power Soccer in the United States. Power Soccer, called Powerchair Football in some countries, is the first competitive team sport designed and developed specifically for power wheelchair users. Participating Athletes' disabilities include spinal cord injury, multiple sclerosis, muscular dystrophy, cerebral palsy, and many others. The fast-paced soccer-like game is played using modified power chairs for moving and passing the ball in a gymnasium on a regulation basketball court. The USPSA has over 60 teams already competing in the U.S. and competes in international competitions including the Powerchair Football World Cup held every four years. 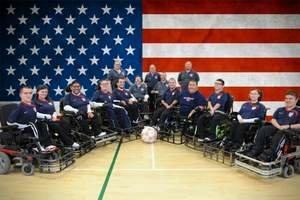 The U.S. National Power Soccer Team (Team USA) has won the past two World Cups held in Japan and France. "MK Battery is deeply honored to have the opportunity to lend our support to such a vital organization," said Wayne Merdinger, MK Battery VP of Business Development & International Sales. "The sport of Power Soccer enhances the lives of those with disabilities and we are extremely proud to be taking such an active role in the program. It is a perfect sponsorship match for our company. We have provided reliable power to wheelchair users for years, and we were flattered to learn that our batteries have been in use by most of these athletes for some time. A team sport brings competitive excitement into the lives of the athletes and their families. We want to help that opportunity grow for as many people as possible."